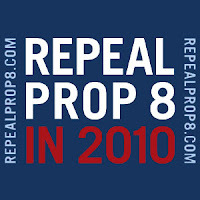 April 13, 2010 /LGBT News/ A measure that would have repealed Proposition 8 will not qualify for this November's ballot since supporters of the campaign to overturn California's ban on gay marriage did not gather enough signatures. Restore Equality 2010 chairman, Sean Bohac, attributed the failure of gathering the nearly 695,000 signatures needed to the lack of support from more mainstream gay rights groups, according to the Associated Press. "We didn't meet our targets and that's all I'm going to say," said John Henning, executive director of the Los Angeles-based Love Honor Cherish, which was part of a coalition to put a repeal on the ballot. Henning said the decision by some major gay rights groups to back a 2012 repeal instead of a 2010 repeal hurt fundraising and volunteer efforts. Prop. 8 passed in November 2008 with 52 percent of the vote.